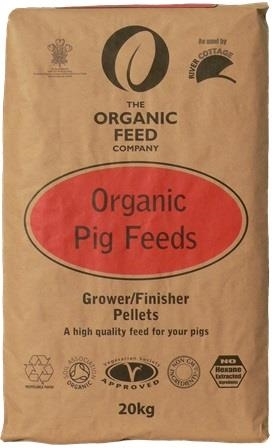 Organic Pig Grower/Finisher is an ideal feed for a natural ’unforced’ growth rate feed from eight weeks until finish (can be fed to young pigs if made into a crumbly mash by adding water). All Organic Feed Company products are made with 100% Organically Grown Natural Ingredients. Introduce a new feed gradually over 7 to 10 days to help a smooth change over. Feed up to about 4kg/day (split into two feeds). Free range pigs and those with access to other feed sources may need reduced amounts (1.0-2.5kg/day).This feed should be fed with ad lib fresh water.